I was recently investigating some statistics related to the music industry and came across some interesting information that I was not aware of (though I should have been). I started to post a question on H:SE asking for verification of what I found but further searches turned up some additional sources which verified what I had discovered. There happens to be a misconception in popular culture about this topic because the information reported by the industry is misleading. I thought it would be interesting or fun for others if I posted a question on H:SE about it to allow others to research the topic as well and discover what I found, but since I know the answer it seemed disingenuous to do so. Thoughts? Should I just file this away in the cobwebs of my own mind as a happy little fact that makes me smile? Or would posting something like this on H:SE be ok? I thought I would ask here before abandoning the idea. I trust the feedback I will receive here as being what's best for H:SE. 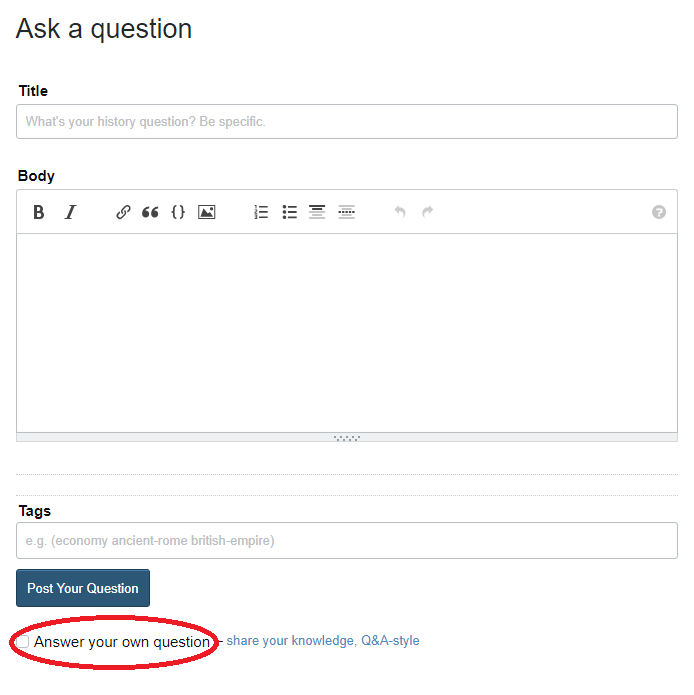 Self-answered questions are fine on Stack Exchange, subject to the usual caveats about being on-topic for the site .etc. Then just type in your answer, before submitting the question and answer together. However, if you already know the answer, I would post it with your question (although by all means encourage others to research, and add further answers if they discover more). Otherwise it may appear like you are posting "quiz" questions (which really haven't gone down well here in the past). Sempaiscuba is right that in general there's nothing wrong with doing this. However, for me at least here on this site, I've had some practical problems with that in the past. If you post the correct answer with the question, the problem is that there's no real point in anyone else posting an answer. From my POV as a poster, you knew what answer you wanted from go, and even if I think its wrong and have a much better one, most likely you're just going to stick with accepting your own, which will forever appear at the top. So there isn't much point in bothering to answer. If you don't post the correct answer with the question, I can tell you from experience that other answerers here are maddeningly great at posting well-written answers that may get lots of upvotes, but don't much resemble your "right" answer. I've done this myself in the past a few times, and have never been very satisfied with the results. The main problem is that other posters persistently post answers that in my mind weren't the Right Answer when I thought up the question. Exhibit A is this question I posted, which I finally had to answer myself after waiting 2 years. Either way, its a lot like posting a job opening with a "preferred candidate". Ultimitely, it just doesn't seem fully fair to everyone else. What's your question voting policy? How should we handle negative counterfactuals?